Wednesday November 30th 1898 I was busy with the work most of the day. We intended to go up to Stevens tonight to see if we could hear how Edith is but it was so cold we gave it up. Thursday December 1st 1898 This is Otts birthday. I saw John Stevens this morning and he said Edith was not so well. I had Will go down for Pink and I got things ready to go to town in the afternoon. The Dr thought her a little better in the morning and I came back with Will. weather very cold. 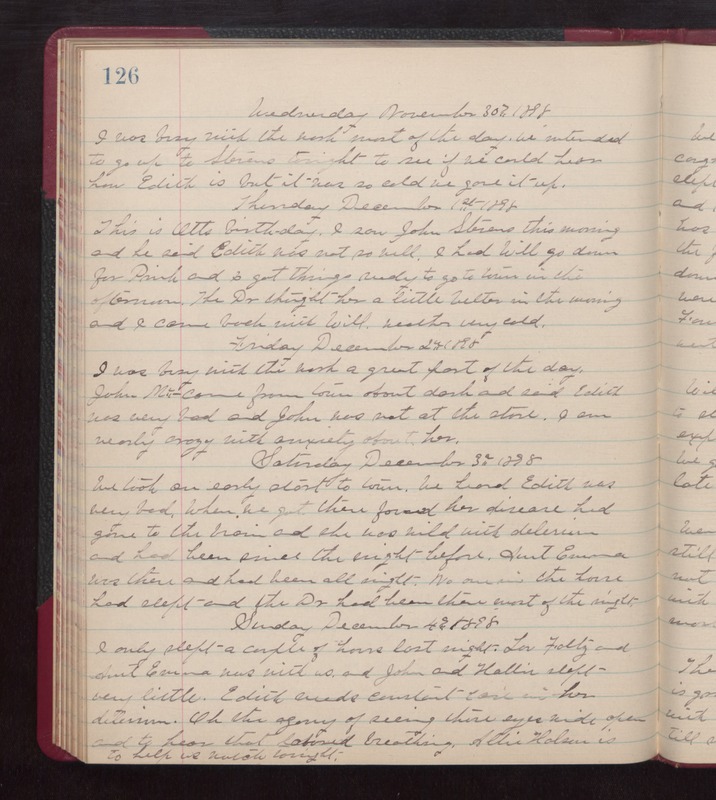 Friday December 2nd 1898 I was busy with the work a great part of the day. John Mc-- came from town about dark and said Edith was very bad and John was not at the store. I am nearly crazy with anxiety about her. Saturday December 3rd 1898 We took an early start to town. We heard Edith was very bad. When we got there found her disease had gone t the brain and she was wild with delerium and had been since the night before. Aunt Emma was there and had been all night. No one in the house had slept and the Dr Had been there most of the night. Sunday December 4th 1898 I only slept a couple of hours last night. Lou Foltz and Aunt Emma was with us and John and Hattie slept very little. Edith needs constant care in her delirium. Oh the agony of seeing those eyes wide open and to hear that labored breathing. Allie Holson is to held us watch tonight.